Oil on wood (cityscape) haye. Period late nineteenth early twentieth. Panel dimensions: 40cm x 30cm. Netherlands - Belgium - Germany 45. 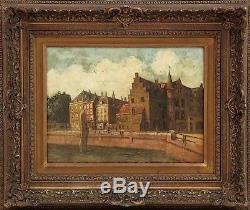 Oil painting dutch school (urban landscape haye - netherlands). Period end 19th beginning 20th century. Size of oil painting 40cm x 30cm.